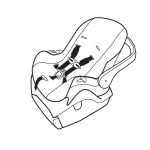 As you can see from the screenshots, the Sunshine Baby Alarm reports the status of your child in their car seat and reminds you not to forget anyone! Find out how to keep your family safe. Order your Sunshine Baby Alarm today!